Even just a few missing teeth can cause a multitude of serious dental health problems, not to mention how they can affect a person’s confidence! Those with missing teeth are more likely to develop bite problems and gum disease, the ladder of which is actually the leading cause of adult tooth loss! To help fill in the gaps, Dental Designs of New England is ready to provide a proven solution: partial dentures. 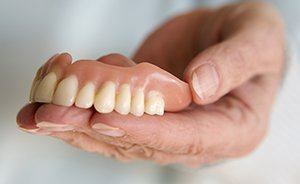 A removable partial denture is an attractive and affordable solution if you have multiple missing teeth. Today, partials can be made from flexible, comfortable plastics that are barely detectable to others. Many times, partials are used in situations where a fixed bridge cannot be placed. A partial is designed to be taken out so you can brush and clean your teeth as well as the prosthetic. What if You're Missing All of Your Teeth? Then a full denture is your answer. And, with dental implants, you can have a denture you never have to worry about staying in place. We have many solutions for missing teeth. 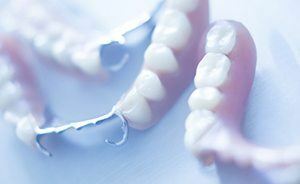 Call us today to find out if you are a candidate for dental bridges, dentures, or dental implants.